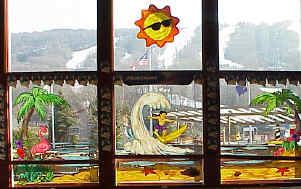 The Largest (and Best) Ski Resort in the Poconos. Is 3.5 miles off Exit 45 of I-80, in Tannersville, Pa. 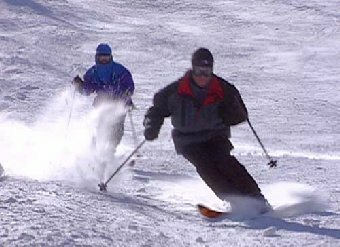 There is skiing and/or boarding on Camelback's 33 trails, including 26 for night skiing. 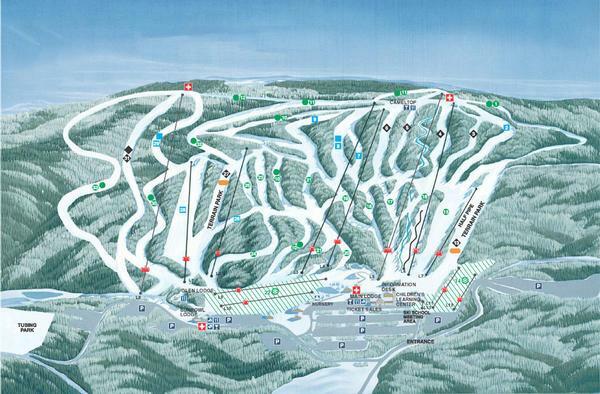 There are 12 lifts, including two high-speed detachable quad lifts (fast and dependable); and a lighted terrain park and half-pipe exclusively for borders. 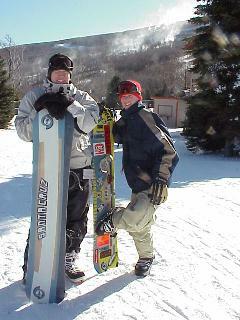 Skiers will enjoy the mile long top-to-bottom advanced novice cruising trail called The Nile Mile. 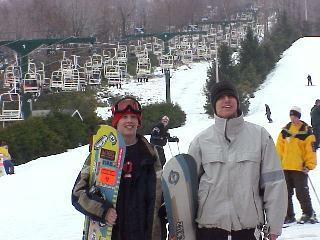 Served by the Stevenson Express high-speed quad chairlift, this run is one of the best in the Poconos. The half-pipe is wide and be groomed with a Pipe Dragon. 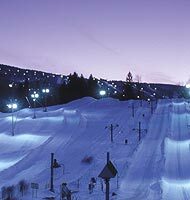 The Camelback snow tubing park has three tows, seven runs and giant "family tubing". The rental shop has the latest equipment in good condition with both new and older snowboards with step in binding systems and plenty of the newer shape skis. There are two rentals shops (go to the sunbowl the lines are usually shorter). Learn-To-Ski packages are reasonable when combined with rentals, lifts and lessons and are offered for all ages in the PSIA certified ski school. Don't miss Camelbeach Waterpark in the summer! Book Your Ski Vacation Lodging Online Here! Best Thing: Size, amount of snow, fastest lifts. Worst Thing: Windy, when we were there. Reason To Go: Amount of space. Lift Lines: Long, but not long enough to gripe about. 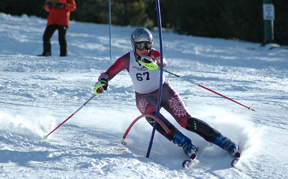 Best Trail: Nile mile for cruising, King Tut for challenge, Raceway for carving. Staff: Lots and very nice. Half Pipe or Boarder Friendly: Great park and pipe. Comments: Loved the mountain. Lodge music was OK, but probably chosen by some old guy. Not enough jumps on regular trails. "We'll Be Back"